BARRYTOWN -- The launching of her business, fabsweaters.com, was not Judy Schmitz's intention. In fact, the information technology specialist for AOL Time Warner in New York City was merely passing the time knitting sweaters for her children on the daily two-hour train ride in and out of the city when she started getting requests from other commuters. ''I was only doing it for my family and friends until two years ago,'' Schmitz said. And then she began taking orders and selling the sweaters to her fellow passengers. ''Then in August of this year, I went whole hog using knitters and suppliers,'' Schmitz said. Further increasing her customer base, Schmitz launched her Web site in September. To meet growing demand for her hand-crafted pieces, Schmitz went to craigslist.org, a nonprofit, grassroots Web site to hire knitters. Today, Schmitz has about a half-dozen women from all over the country and as far as Ecuador making sweaters and hats for fabsweaters.com. Schmitz said fabsweaters.com's success is due to a mix of old-fashioned knitting and modern-day technology she uses to manage her business. 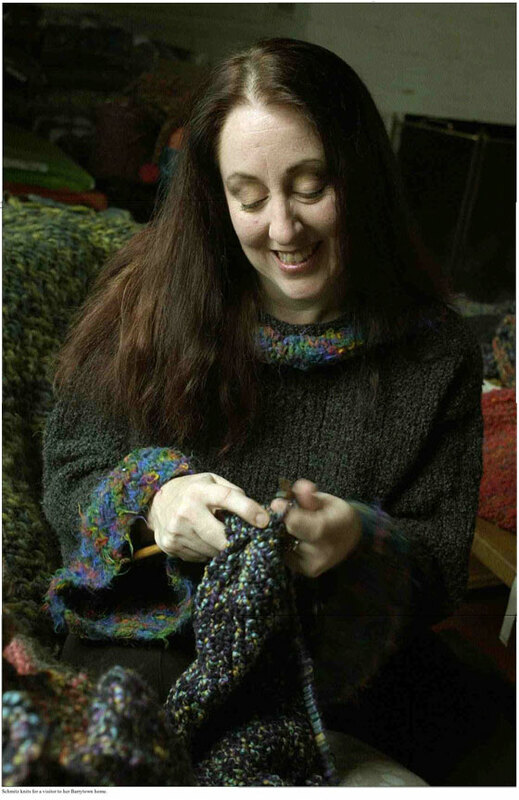 She communicates with her knitters al-most exclusively by instant messaging and e-mail. Schmitz uses her laptop while on the train for all of her business transactions. She receives orders and manages shipping orders through an account with United Parcel Service. "It's an interesting contrast, isn't it?'' Schmitz quipped. Available almost exclusively online, Schmitz's products are a collection of Mohair, Alpaca and Merino blends of hand-knit infant and children's sweaters and hats available on her Web site. One store, No Sugar Baby in Rhinebeck, also carries her line. The infant and toddler's sweaters range in price from $45 to $85 and hats range from $15 to $28. Schmitz is also expanding her line to adult-sized sweaters. Monique Heeremans is proprietor of No Sugar Baby, which opened in August. She said she sells fabsweaters because the styles match her store's European flair. ''It's totally different from what people are used to. I tend to shy away from pastel blues and pinks and bunnies and bears. The store has a very different feeling and that's why I chose her,'' Heeremans said. Schmitz's future plans don't include getting noticed by retailers. ''One of the things I want to do is keep it small. I just want to integrate it into my life, but not let it take over my life,'' she said. 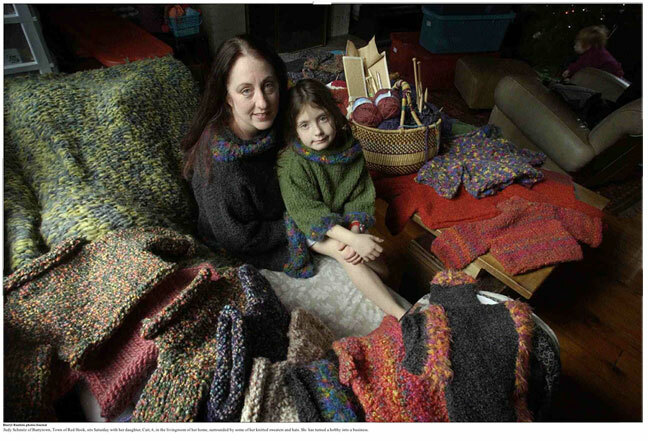 Judy Schmitz of Barrytown, Town of Red Hook, sits Saturday with her daughter, Cait, 6, in the livingroom of her home, surrounded by some of her knitted sweaters and hats. She has turned a hobby into a business. Schmitz knits for a visitor to her Barrytown home.